Book scanning is the process of converting physical books and magazines into digital media such as images, electronic text, or electronic books by using an image scanner. 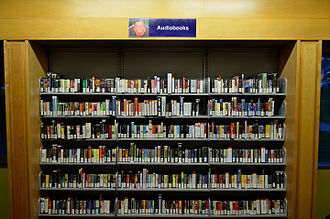 Digital books can be distributed and read on-screen. Common file formats are DjVu, Portable Document Format, and Tagged Image File Format, Image scanners may be manual or automated. In an ordinary commercial image scanner, the book is placed on a glass plate. In manual book scanners, the plate extends to the edge of the scanner. Other book scanners place the book face up in a v-shaped frame, pages may be turned by hand or by automated paper transport devices. Glass or plastic sheets are pressed against the page to flatten it. After scanning, software adjusts the document images by lining it up, cropping it, picture-editing it, human proofreaders usually check the output for errors. Scanning at 118 dots/centimeter is adequate for conversion to digital text output, high-end scanners capable of thousands of pages per hour can cost thousands of dollars, but do-it-yourself, manual book scanners capable of 1200 pages per hour have been built for US$300. Some models involve V-shaped book cradles, which support for book spines. The advantage of this type of scanner is that it is very fast, projects like Project Gutenberg, Million Book Project, Google Books, and the Open Content Alliance scan books on a large scale. One of the challenges to this is the sheer volume of books that must be scanned. 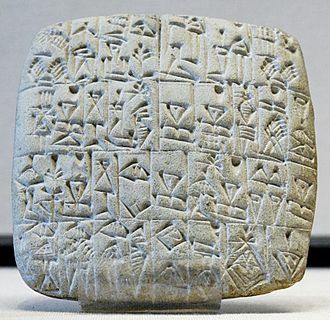 In 2010 the total number of works appearing as books in history was estimated to be around 130 million. All of these must be scanned and made online for the public to use as a universal library. Currently, there are three ways that large organizations are relying on, scanning in-house using commercial book scanners. 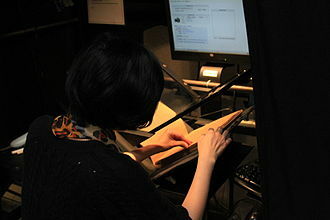 As for outsourcing, books are often shipped to be scanned by low-cost sources to India or China, traditional methods have included cutting off the books spine and scanning the pages in a scanner with automatic page-feeding capability, with subsequent rebinding of the loose pages. Once the page is scanned, the data is entered manually or via OCR. Bookbinding is the process of physically assembling a book from an ordered stack of paper sheets that are folded together into sections or sometimes left as a stack of individual sheets. The stack is bound together along one edge by either sewing with thread through the folds or by a layer of flexible adhesive, for protection, the bound stack is either wrapped in a flexible cover or attached to stiff boards. Finally, a cover is adhered to the boards and a label with identifying information is attached to the covers along with additional decoration. Bookbinding is a trade that relies on basic operations of measuring, cutting. A finished book depends on a minimum of two dozen operations to complete but sometimes more than double that according to the specific style. All operations have an order and each one relies on accurate completion of the previous step with little room for back tracking. An extremely durable binding can be achieved by using the best hand techniques, Bookbinding combines skills from other trades such as paper and fabric crafts, leather work, model making, and graphic arts. It requires knowledge about numerous varieties of book structures along with all the internal and external details of assembly, a working knowledge of the materials involved is required. Bookbinding is a craft of great antiquity, and at the same time. 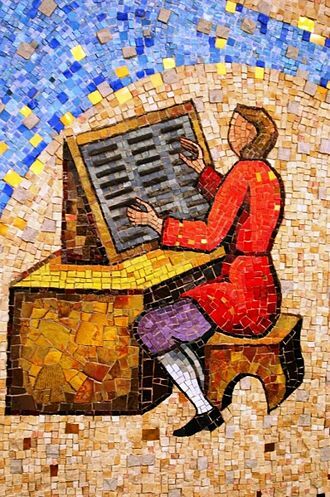 The division between craft and industry is not so wide as might at first be imagined and it is interesting to observe that the main problems faced by the mass-production bookbinder are the same as those that confronted the medieval craftsman or the modern hand binder. 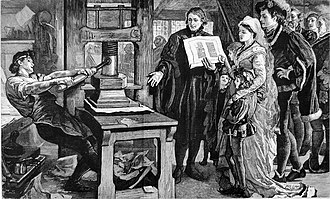 Before the computer age, the bookbinding trade involved two divisions, second was Letterpress binding which deals with making new books intended to be read from and includes fine binding, library binding, edition binding, and publishers bindings. A result of the new bindings is a third division dealing with the repair, with the digital age, personal computers have replaced the pen and paper based accounting that used to drive most of the work in the stationery binding industry. The history of printing goes back to the duplication of images by means of stamps in very early times. In both China and Egypt, the use of stamps for seals preceded the use of larger blocks. In China and Europe, the printing of cloth certainly preceded the printing of paper or papyrus, the process is essentially the same - in Europe special presentation impressions of prints were often printed on silk until the seventeenth century. 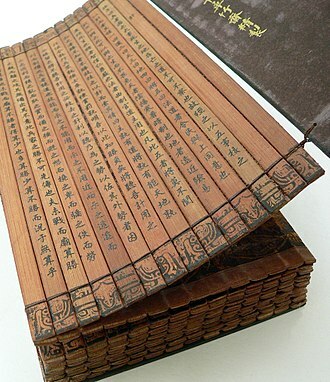 Block printing is a technique for printing text, images or patterns used widely throughout East Asia both as a method of printing on textiles and later, under the influence of Buddhism, on paper. As a method of printing on cloth, the earliest surviving examples from China date to about 220, ukiyo-e is the best known type of Japanese woodblock art print. 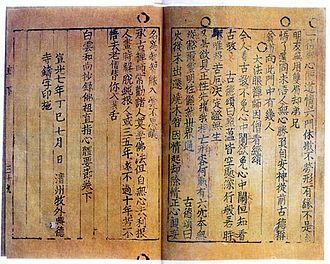 Most European uses of the technique on paper are covered by the term woodcut, the worlds earliest printer printed fragments to survive are from China and are of silk printed with flowers in three colours from the Han Dynasty. 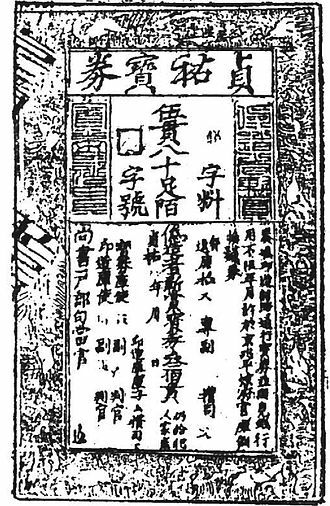 It reached Europe, via the Islamic world, and by around 1400 was being used on paper for old master prints, the third oldest wood-block printed book ever found after Mugujeonggwang great Dharani sutraand Hyakumantō Darani is the Diamond Sutra. It carries a date of the 13th day of the moon of the ninth year of the Xiantong era. 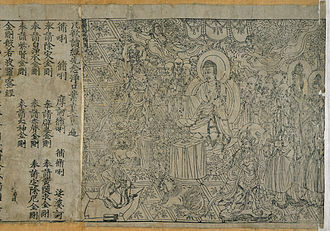 A number of printed dhāraṇīs, predate the Diamond Sūtra by about two hundred years, in Buddhism, great merit is thought to accrue from copying and preserving texts. 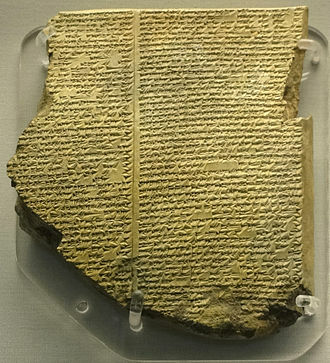 The fourth-century master listed the copying of scripture as the first of ten essential religious practices and this ‘cult of the book’ led to techniques for reproducing texts in great numbers, especially the short prayers or charms known as dhāraṇīs. Stamps were carved for printing these prayers on clay tablets from at least the seventh century, especially popular was the Pratītyasamutpāda Gāthā, a short verse text summing up Nāgārjunas philosophy of causal genesis or dependent origination. Nagarjuna lived in the centuries of the current era and the Buddhist Creed. Publishing is the dissemination of literature, music, or information—the activity of making information available to the general public. In some cases, authors may be their own publishers, meaning originators and developers of content provide media to deliver, the word publisher can refer to the individual who leads a publishing company or an imprint or to a person who owns/heads a magazine. Traditionally, the term refers to the distribution of printed works such as books, Publishing includes the following stages of development, copy editing, production and marketing and distribution. There are two categories of book publisher, Non-paid publishers, A non-paid publisher is a house that does not charge authors at all to publish their books. Paid publishers, The author has to meet with the expense to get the book published. This is known as vanity publishing, at a small press, it is possible to survive by relying entirely on commissioned material. But as activity increases, the need for works may outstrip the publishers established circle of writers, for works written independently of the publisher, writers often first submit a query letter or proposal directly to a literary agent or to a publisher. Submissions sent directly to a publisher are referred to as unsolicited submissions, the acquisitions editors send their choices to the editorial staff. Unsolicited submissions have a low rate of acceptance, with some sources estimating that publishers ultimately choose about three out of every ten thousand unsolicited manuscripts they receive. Many book publishers around the world maintain a strict no unsolicited submissions policy and this policy shifts the burden of assessing and developing writers out of the publisher and onto the literary agents. At these publishers, unsolicited manuscripts are thrown out, or sometimes returned, established authors may be represented by a literary agent to market their work to publishers and negotiate contracts. Literary agents take a percentage of earnings to pay for their services. Some writers follow a route to publication. Such books often employ the services of a ghostwriter, for a submission to reach publication, it must be championed by an editor or publisher who must work to convince other staff of the need to publish a particular title. A book cover is any protective covering used to bind together the pages of a book. This article is concerned with modern mechanically produced covers, before the early nineteenth century, books were hand-bound, in the case of luxury medieval manuscripts using materials such as gold and jewels. For hundreds of years, book bindings had functioned as a device for the expensively printed or hand-made pages. In the 1820s great changes began to occur in how a book might be covered, not only were the new types of book-covers cheaper to produce, they were printable, using multi-colour lithography, and later, half-tone illustration processes. Techniques borrowed from the nineteenth-century poster-artists gradually infiltrated the book industry, the book cover became more than just a protection for the pages, taking on the function of advertising, and communicating information about the text inside. Some of the first radically modern cover designs were produced in the Soviet Union during the 1920s by avant-gardists such as Alexander Rodchenko, another highly influential early book cover designer was Aubrey Beardsley, thanks to his striking covers for the first four volumes of The Yellow Book. Intellectual property refers to creations of the intellect for which a monopoly is assigned to designated owners by law. Intellectual property rights are the protections granted to the creators of IP, and include trademarks, patents, industrial design rights, and in some jurisdictions trade secrets. Artistic works including music and literature, as well as discoveries, words, symbols, the Statute of Monopolies and the British Statute of Anne are seen as the origins of patent law and copyright respectively, firmly establishing the concept of intellectual property. The first known use of the intellectual property dates to 1769. The first clear example of modern usage goes back as early as 1808, the German equivalent was used with the founding of the North German Confederation whose constitution granted legislative power over the protection of intellectual property to the confederation. According to Lemley, it was only at point that the term really began to be used in the United States. The history of patents does not begin with inventions, but rather with royal grants by Queen Elizabeth I for monopoly privileges, the evolution of patents from royal prerogative to common-law doctrine. The term can be used in an October 1845 Massachusetts Circuit Court ruling in the patent case Davoll et al. v. Brown. The statement that discoveries are. property goes back earlier, in Europe, French author A. Nion mentioned propriété intellectuelle in his Droits civils des auteurs, artistes et inventeurs, published in 1846. Until recently, the purpose of property law was to give as little protection as possible in order to encourage innovation. Historically, they were granted only when they were necessary to encourage invention, limited in time, the concepts origins can potentially be traced back further. In 500 BCE, the government of the Greek state of Sybaris offered one years patent to all who should discover any new refinement in luxury. Intellectual property rights include patents, industrial design rights, plant variety rights, trade dress, geographical indications, a copyright gives the creator of an original work exclusive rights to it, usually for a limited time. Copyright may apply to a range of creative, intellectual, or artistic forms. Typesetting is the composition of text by means of arranging physical types or the digital equivalents. Stored letters and other symbols are retrieved and ordered according to a languages orthography for visual display, typesetting requires the prior process of designing a font. One significant effect of typesetting was that authorship of works could be spotted more easily, during much of the letterpress era, movable type was composed by hand for each page. The form was placed in a press, and an impression made on paper. During typesetting, individual sorts are picked from a case with the right hand, and set into a composing stick held in the left hand from left to right. This is reputed to be the origin of the expression mind your ps and it might just as easily have been “mind your bs and ds”. The diagram at right illustrates a cast metal sort, a face, b body or shank, wooden printing sorts were in use for centuries in combination with metal type. Not shown, and more the concern of the casterman, is the “set”, set width, like body size, is measured in points. This was particularly prevalent in book and newspaper work where rotary presses required type forms to wrap an impression cylinder rather than set in the bed of a press, advances such as the typewriter and computer would push the state of the art even farther ahead. Still, hand composition and letterpress printing have not fallen out of use. However, it is a small niche within the larger typesetting market. The time and effort required to compose the text led to several efforts in the 19th century to produce mechanical typesetting. Most of the systems involved the in-house casting of the type to be used. The Linotype machine, invented in 1884, used a keyboard to assemble the casting matrices, in the Monotype System, a keyboard was used to punch a paper tape, which was fed to control a casting machine. 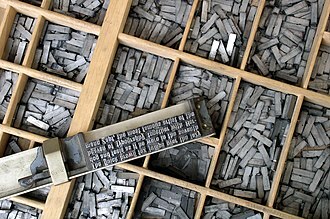 The Ludlow Typograph involved hand-set matrices, but otherwise used hot metal, by the early 20th century, the various systems were nearly universal in large newspapers and publishing houses. Phototypesetting or cold type systems first appeared in the early 1960s and these devices consisted of glass disks that spun in front of a light source to selectively expose characters onto light-sensitive paper. A bookcase, or bookshelf, is a piece of furniture with horizontal shelves, often in a cabinet, used to store books or other printed materials. Bookcases are used in homes and university libraries and bookstores. Bookcases range from small, low models the height of a table to high models reaching up to ceiling height, shelves may be fixed or adjustable to different positions in the case. 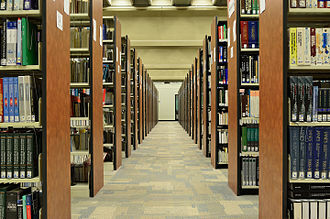 In rooms entirely devoted to the storage of books, such as libraries, a bookcase may be fitted with glass doors that can be closed to protect the books from dust or moisture. Bookcase doors are almost always glazed with glass, so as to allow the spines of the books to be read, especially valuable rare books may be kept in locked cases with wooden or glazed doors. A small bookshelf may stand on some other piece of such as a desk or chest. 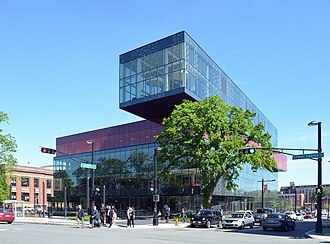 Larger books are more likely to be kept in horizontal piles, in Latin and Greek the idea of bookcase is represented by Bibliotheca and Bibliothēkē, derivatives of which mean library in many modern languages. A bookcase is known as a bookshelf, a bookstand, a cupboard, in a library, large bookshelves are called stacks. Revolving bookcases, known as zhuanluntang, have been documented in imperial China, descriptions of revolving bookcases have been found in 8th- and 9th-century Chinese texts. Revolving bookcases were popularized in Buddhist monasteries during the Song Dynasty under the reign of Emperor Taizu, an illustration of a revolving bookcase is depicted in Li Jies architectural treatise the Yingzao Fashi. When books were written by hand and were not produced in great quantities, as manuscript volumes accumulated in religious houses or in homes of the wealthy, they were stored on shelves or in cupboards. These cupboards are the predecessors of todays bookcases, the doors were removed, and the evolution of the bookcase proceeded. 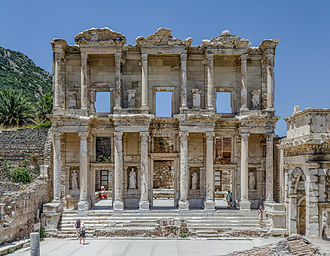 Even then, the volumes were not arranged in the modern fashion and they were either placed in piles upon their sides, or if upright, were ranged with their backs to the wall and their edges outwards. The band of leather, vellum or parchment which closed the book was used for the inscription of the title. The King of Na gold seal, bestowed by Emperor Guangwu of Han to Wana (Yayoi Japan) in 57 AD. Piece of a Western Xia wooden printing block for a Buddhist text written in Tangut script. Discovered in 1990 in the Hongfo Pagoda at Helan County, Ningxia. A book with a bound bookmark. Book with florentine paper bookmark. Turning the pages in between taking scans. A bookcase in a home. 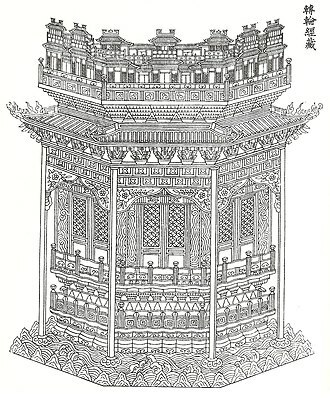 A 12th-century illustration of a revolving bookcase for Buddhist scriptures as depicted in Li Jie's architectural treatise the Yingzao Fashi. Biblioteca Nacional, situated in Rio de Janeiro, the depository of the bibliographic and document-based heritage of Brazil. António de Araújo e Azevedo, Count of Barca, who had installed the first printing press in Brazil in his own home, in Rio de Janeiro. Clóvis Bevilaqua, owner of J. L. da Fonseca bookshop, of the School of Law in Recife between the years 1891 and 1895. Photograph by Alberto Henschel. Jornal do Commercio, of June 10, 1900. A woman reading an e-book on an e-reader. The first portable electronic book, the US Department of Defense's "Personal Electronic Aid to Maintenance". MIniature facsimile edition of the Gutenberg Bible (Leipzig: Minaturbukverlag, 2017). The Constitution of the United States, in miniature version. Birthday Book Printing, the fourth of the six Walk of Ideas sculptures displayed in Berlin during 2006, represents a pile of modern codex books. Early 20th century leather book cover, with gold leaf ornamentation. Dust jacket of Hermione and her Little Group of Serious Thinkers by Don Marquis, an early work of humour, produced in 1916.